From the creators of Gilmore Girls. 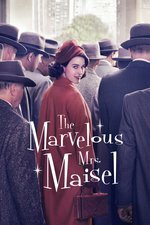 Set in early 1960s Manhattan, The Marvelous Mrs. Maisel is a 60-minute dramedy that centers on Miriam "Midge" Maisel, a sunny, energetic, sharp, Jewish girl who had her life mapped out for herself: go to college, find a husband, have kids, and throw the best Yom Kippur dinners in town. Soon enough, she finds herself exactly where she had hoped to be, living happily with her husband and two children in the Upper West Side. A woman of her time, Midge is a cheerleader wife to a man who dreams of a stand-up comedy career, but her perfect life is turned upside down when her husband suddenly leaves her for another woman. Completely unprepared, Midge is left with no choice but to reevaluate what to do with her life. When she accidentally stumbles onto the stage at a comedy club, she soon discovers her own comedic skills and decides to use this newfound talent to help her rebuild a different life for herself. The series will trace the trajectory of Midge's journey as she goes on to pursue a career in the male-dominated, stand-up comedy profession, and transforms from uptown housewife to East Village club performer. I watched this episode when it first came out on Amazon, and have been really looking forward to the series. I'm going to try not to sit down and watch the whole thing this weekend, but it's going to be a fight. Oh, I'm ABSOLUTELY going to binge this like crazy this weekend, I've been dying for it since I started seeing promos! Really, really dug the pilot; I enjoyed my internal progression from "wow, his act reminds me a lot of the way I've heard Bob Newhart's early stuff described" to "OH." Lot of discussion in our house over how heavily based on the life of Joan Rivers this is. It was apparent in the second episode that Susie is a time traveler. She talks curses like she's from 2017. I loved this, and just have one more episode last, and I'm on my way to get a pastrami sandwich right now because all I've had in my head since starting this is my great grandma telling me there's a platter of deli in the kitchen so go eat something. I'm three episodes in and am totally hooked. What a great series! Rachel Brosnahan is awesome in the lead role. It makes me appreciate how hard Joan Rivers and other women had to fight to be able to do comedy. It also makes me more aware of the type of BS my mom (and most women) had to deal with back then, which is sad but fascinating. Loving this show. Just loving it. More like this! Yeah, the one clinky note is the language of the present day - even things like "nerd alert" and the like. But it's fine. The rest of the period reconstruction is so painstaking, I want to believe the abundant use of present-day language is maybe intentional, so it won't feel so twee. Loving this show! It's pretty much the perfect thing to watch with my mother too. I'm having to prevent her from binge watching it while I'm at work. I really, really like how clear they are about the women fitting around their men as a survival strategy.